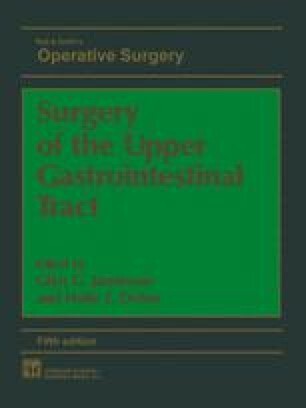 The surgical treatment of oesophageal achalasia is a 20th century development, the most significant contribution being that of Heller who, in 1913, performed a double cardiomyotomy by the abdominal route on a 49-yearold woman who had experienced dysphagia for 30 years. This technique later underwent many modifications, the most important of which was restriction of the procedure to one myotomy. This has been further modified to include an antireflux procedure, an addition which, in the author’s opinion, is unnecessary.